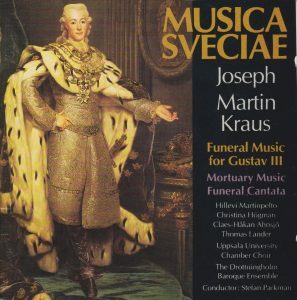 Joseph Martin Kraus: Funeral Music for Gustav III (Mortuary Music, Funeral Cantata). Hillevi Martinpelto, Christina Högman, Claes-Håkan Ahnsjö, Thomas Lander, Drottningholm Baroque Ensemble, Uppsala University Chamber Choir, Stefan Parkman. Musica Sveciae MSCD 416 (1988), barcode 7392068204166. Also found under barcodes 7392068204302, 013951848768. Recorded 9-11 October 1987 in th Concert Hall of the Academy of Music, Stockholm. Joseph Martin Kraus’ dates (1756-1792) make him an exact contemporary of Mozart, integral with the untimely death at the age of 36 (of tuberculosis), one year and ten days after Mozart (he was his younger by a mere five months). He was born and trained in Germany but his compositional career really started in full in 1781, at 25, when he entered the service of the enlightened King of Sweden Gustav III, after three years spent in Stockholm in dire conditions vying for recognition. Gustav even sponsored Kraus on a four-year training tour of Europe, from October 1782 to the end of 1786 – the ancient regime version of J. William Fulbright, I call it. As for Gustav, he was kind of the Swedish Lincoln or Kennedy, not because he abolished slavery or stood up to the Russians (although, for the latter, he did, to regain the Baltic provinces, but only after having allied with them to conquer Norway) but because of his assassination (and Gustav is famous for providing the model of Ricardo in Verdi’s Ballo in Maschera, derived from Auber’s Gustave III ou le Bal masqué). In fact Gustav is a highly controversial figure, an enlightened despot, admirer of Voltaire, who cut down the powers of the parliamentary nobility (the Brits and the French would have chopped his head off after a mock trial, and had he been a Roman some 1700 years earlier, his own son would have stabbed him), legalized Catholic and Jewish presence in Sweden and lavished a lot of money on the arts. So, although it would have been part of his official duties anyway, one can surmise that Kraus’ funeral hommages to Gustav – the instrumental Mortuary Music (a four-movement symphony in all but name), when the corpse was taken to lay in state, and the Funeral Cantata for the funeral proprer, on the next day – were deeply felt. Himself died a mere nine months after his patron, an admirable case of a servant’s faithfulness to his master. 30 years after the commercialization of the CD, nothing is rare anymore, although Kraus and his cantata are far from an abudant presence on CD. 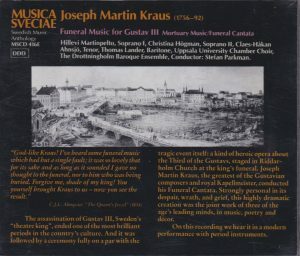 This recording, made in October 1987 by Stefan Parkman leading the Drottningholm Baroque Ensemble and Uppsala University Chamber Choir, was only the second of the Funeral Cantata after the pionneering effort of Newell Jenkins and his Clarion Concerts Chorus & Orchestra for Vanguard in 1969 (CD-reissued on Vanguard SVC-61 in 1997), and the first on period instruments. Since then, so far as I am aware, there’s been only one more, which I haven’t heard, on Deutsche Harmonia Mundi, “Begrabniskantate”, by L’Arte del Mondo, barcode 888837645423 (also, as this one, with the complement of the Mortuary Symphony). There’s a long way to go before it reaches the recorded status of Mozart’s Requiem. It’s a powerful work, and, yes, Mozart’s Requiem comes to mind at times, with a long, somber and brooding orchestral introduuction (track 5), explosive opening chorus (track 6), furious tenor aria that could almost be Tamino running away from the snake in Bergman’s Swedish-sung Magic Flute (track 7), passionate soprano aria that could be Dona Anna or Dona Elvira furiously raging at Don Giovanni (track 8), a duet here attributed to soprano II and tenor (about that see below) that could come from… Gluck’s Orfeo (track 9), etc. That said, as well-disposed as I am in principle towards “Historically-Informed Performances”, I don’t find this one to be an entirely convincing rendition of the music. It is certainly more HIP than Jenkins, e.g. generally more flowing, less “funeral” as we understand it today, almost jolly even is some passages, and also on a smaller scale – and played half a pitch lower. But Jenkins is together more brooding in the brooding moment of the orchestral introduction, and, always, incomparably grander and more dramatic – not a matter of tempo (although it sometimes is, also), but of heft. Musica Sveciae’s acoustics aren’t ideal other, and the music comes out a bit muffled, lacking sharp attacks. In the moving cantilenas with bassson of the Overture, the bassoon doesn’t come out enough (1:07, 2:15), robbing the music of some of its emotion. But Parkman, and possibly his Drottningholm Ensemble and Chorus, are also to blame in this lack of pungency. Both tenors have a nasal strain to their timbres, but Jenkins’ tenor Ragnar Ulfung is significantly more dramatic and virile than Claes-Håkan Ahnsjö, and he is helped by Jenkins’ incomparably more dramatic conducting too. In the introductory recitative to his first aria, you get the sense that he storms in wrath at the death of his beloved sovereign , where Ahnsjö (track 7) just wails, and in the aria itself, there is simply no contest: despite their marginally swifter tempo, Parkman and Ahnsjö sound polished and polite, where Ulfung and Jenkins are hugely dramatic. In his next solo aria, track 10, Ahnsjö is lyrical and elegiac, which is a permissible option in view of the lyrics (“He is but dust, the grave his dwelling place / The Throne of Sweden is no longer his”), but again Ulfung is considerably more virile and dramatic, and, ultimately, impressive. The same kind of contrast is found in the soprano arias. Parkman’s soprano Hillevi Martinpelto would be fine if it wasn’t for Jenkins’ extraordinary Joan Marie Moynagh, who has the vocal stuff for the furious arias of Dona Elvira or Dona Anna – why didn’t she make more of a career, I don’t know. Some apparent divergences of editions also come into play. That Jenkins’ fruitier mezzo should be replaced by a higher-voiced soprano II in Parkman’s recording can be considered standard, but in track 9, what was with Jenkins an aria for mezzo and bass becomes one for soprano II and tenor. I don’t know who’s closer to score, but Parkman’s option has the strange result that the bass appears to sing only in one ensemble, the antepenultimate quartet (track 14). At any rate, I find Parkman’s soprano II and tenor less characterful than Jenkins’ mezzo and bass (no less than Kim Borg), evoking less of the Gluckian reminiscences than they did. In the same vein, because of that choice of a soprano II and because Parkman’s bass is in fact a bariton, there isn’t much timbral differenciation in the quartet. The last soprano II or mezzo aria, here track 15, is again incomparably more dramatic with Jenkins, and there it is a matter of tempo: Parkman takes a laid-back and lyrical view and extends it to 3:20, where Jenkins is considerably more urgent, almost raging (2:20). 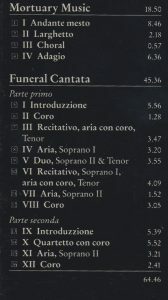 The erudite and thorough liner notes (including the same English translation of the lyrics as on the Vanguard CD of Jenkins), and the complement of the Mortuary Symphony, as fine a specimen as it is of that kind of funeral music, much in use also in France during the years of the revolution, don’t really tip the scale back in favor of the Musica Sveciae release, especially since the same composition is available on various traversals of Kraus’ symphonies, in particular vol. 2 of Concert Köln’s on Capriccio 10 430, which I’ve reviewed, and volume 3 of Naxos complete traversal of Kraus’ symphonies, 8.554777 barcode 636943477724 (which I haven’t heard). That said, Parkman’s reading there is better, with opening timpani that are more dramatic than Concerto Köln’s, occasionally conveying more weight and pathos in the first movement, more passion in the ensuing Larghetto and in the final Adagio (at a more animated tempo than Concerto Köln); but the very contrast of both approches in the Finale, which Concerto Köln take much more funerally and which Parkman’s significantly more animated tempo makes sound first more turbulent, then almost like a moment of relief, acceptance and joy (or maybe like Gustav ascending to Heaven), is illuminating. Still, for the Cantata, those who have the Jenkins recording can safely stay with it, and those who don’t would do well to look for it. If still interested by this Musica Sveciae recording, note that there is something a bit puzzling about it: it is found on various commercial websites under barcode 7392068204302, whch, given the logic of Musica Sveciae’s barcodes, would be the one for MSCD 430. Yet I’ve seen no trace that it was ever issued under that label number. Barcode 7392068204166, which should be the one for MSCD 416, seems to show up only on Swedish websites, and the CD is labeled there MSCD 416S. My copy is MSCD 416E and comes with no barcode – the E obviously stands for English, and indeed that is the exclusive language of the linernotes, so MSCD 416S must be in Swedish only, hence its presence only in Sweden. 416E is also widely found under barcode 013951848768, and I’m not sure what that is, if it’s a distributor’s barcode or one actually printed on the CD.